For a Marine, nutrition is just as important as physical training. What you eat affects not only your weight and health but also your physical and mental performance, the ability to maintain control on the field and how you heal from injury. The basic training diet is aimed at getting the Marine to eat more nutrient-rich foods for optimal performance. The basic training diet starts with balancing calories to maintain a healthy weight. Your daily calorie needs depend on a number of factors, including current weight and height, gender, age and activity. As a Marine in basic training, your activity level is high, which means you need more calories to maintain weight and muscle mass. In general, active female Marines need 2,200 to 2,400 calories a day, and active male Marines 2,800 calories to 3,000 calories a day. Monitoring your weight and intake can help you determine your calorie needs for a healthy weight. A basic training Marine diet plan needs to include foods that fuel the body, which are foods that not only provide calories but health-promoting nutrients as well. 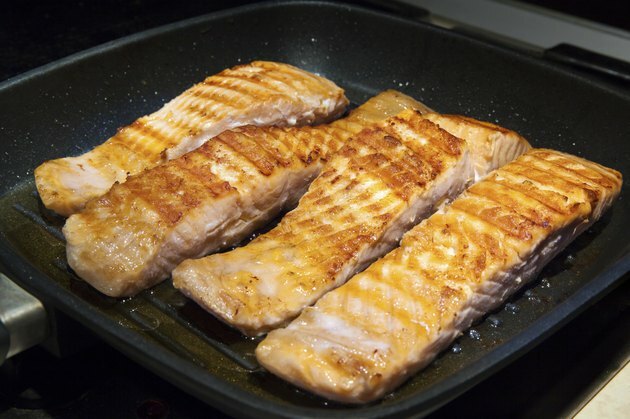 The basic daily Marine diet includes 3 cups of low-fat or nonfat dairy foods such as nonfat milk or low-fat yogurt; 5 1/2 ounces to 6 1/2 ounces of protein, including fresh fish, white meat poultry, beans or tofu; a minimum of 6 ounces of grains, with 1 ounce equaling one slice of whole-wheat bread or 1 cup of unsweetened whole-grain cereal; and at least 2 1/2 cups of fruit and 4 cups of vegetables. For hydration, drink water. In general, you need 1 quart of water for every 50 pounds of body weight, or 3 quarts of water for a 150-pound person. While water should be your first choice for hydration, nonfat milk and unsweetened tea or coffee are also acceptable. For balance, health and energy, eat three meals and three snacks a day. For breakfast, an egg white omelet filled with low-fat cheese, peppers and onions with whole-wheat toast, nonfat milk and a fresh orange make a healthy choice. During your midmorning break, snack on almonds and raisins. A lunch meal might include lean turkey stuffed into a whole-wheat pita with mustard, lettuce and tomato, tossed greens, an apple and nonfat yogurt. Refuel in the afternoon with whole-grain crackers and hummus. At dinner, a healthy meal, such as roasted chicken with green beans and a baked potato, can fill you up. Try a bowl of unsweetened whole-grain cereal with nonfat milk and sliced strawberries as an evening snack. To maximize physical and mental performance during training, limit your intake of foods that are high in fat, sugar and sodium. These foods provide calories but offer very little nutritional value. This includes foods such as fast food, sweets, fried foods and sugar-sweetened drinks like soda and fruit punch. How Many Calories Are Burned in an Hour of Kickboxing?